Looking for a delicious new way to serve summer sweet corn? 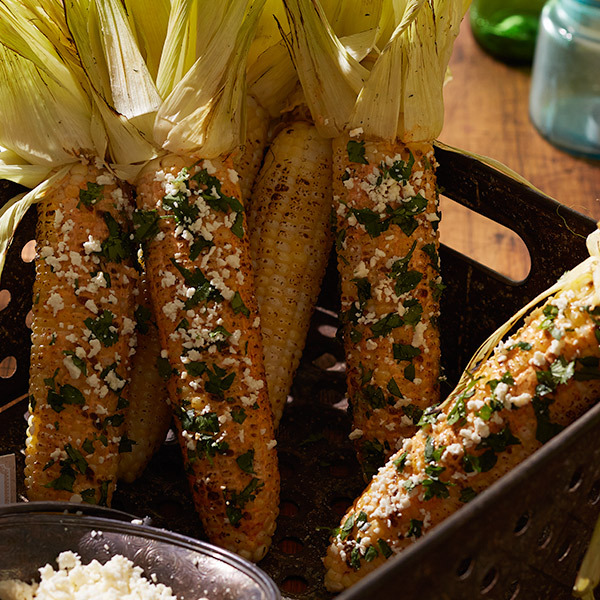 Our Mexican street corn is slathered with a spiced mayonnaise mixture then grilled in the husks. This flavorful street corn recipe makes an easy, yet impressive, side dish—it can be prepped ahead of time and then grilled and rolled in crumbled Cotija cheese and chopped cilantro right in front of your guests. Soak corncobs in a large pot of cold water for at least 1 hour before grilling. Stir together the mayonnaise, garlic, salt, chili powder and cayenne pepper in a small bowl until well combined. Mix the Cotija cheese with the cilantro and place in a shallow dish that is at least as long as the corn. Heat the grill to medium high. Before grilling, carefully peel back the husks of each ear a little more than halfway and remove as much silk as you can without pulling the husks off. Then pull the husks back up. Place the corn on the grill and close the lid. Every 10 minutes, roll the corn a quarter turn so it cooks evenly. Cook until the husks are charred and starting to peel back from the corn, about 35 minutes total. Remove from the grill and set aside until the corn is cool enough to handle. Without detaching the husks, peel them back completely, turning them inside out so they form a handle. Brush the corn with a thin layer of the spiced mayonnaise mixture, roll the cobs in the crumbled cheese-cilantro mixture, and serve. Pass the lime wedges on the side for squeezing over the corn.